After what has felt like a very long Maine winter, April has finally arrived and spring feels so close. In my opinion, March is always the hardest month in Maine, as the warm (think 40 degrees) days are such a tease when they are followed by a blizzard the very next day. Nonetheless, we made the most of March, and in mid-March I traveled to Pittsburgh for an annual conference that brings together ceramics enthusiasts and educators. I had been invited to take part in an exhibition called Cups of Conversation: 50 States at this wonderful café called Everyday Café in Pittsburgh during the conference. Jeni Hansen Gard, a socially engaged ceramic artist and the organizer of this exhibition, invited one artist from each of the 50 states to contribute two cups—one of the cups went to someone from the ceramics community in town for the conference, and the other cup went to someone living in Pittsburgh. The deal was that people would be gifted a cup if they bought a cup of coffee and sat down to have a conversation with one of the exhibition artists. It was a perfect exhibition for the Homemade Exchange to be involved in, and we were thrilled to represent Maine! 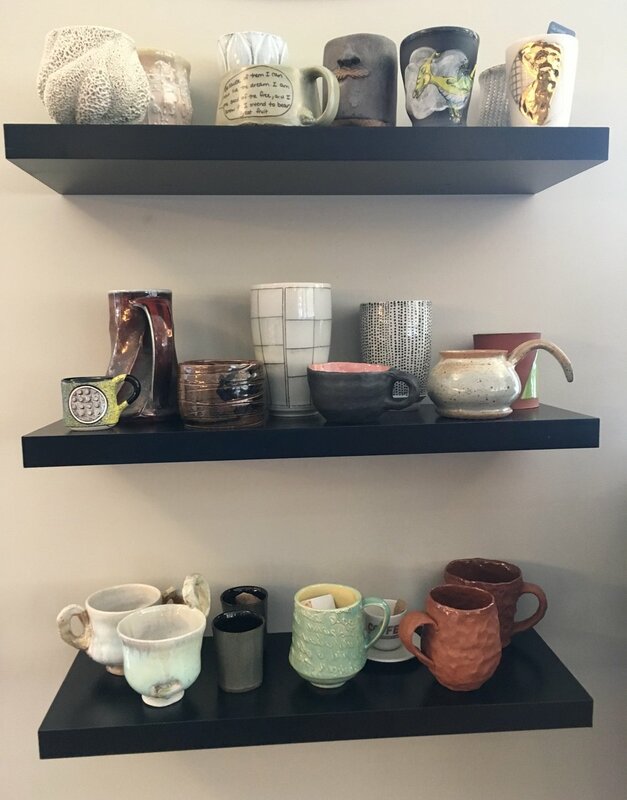 Some of the mugs on display at Everyday Cafe during Cups of Conversation: 50 States. Even though I wasn’t talking to Mainers during this exhibition, I loved using our Homemade Exchange mugs, and the many other mugs from all over the country, as tools to connect with people in a new place. I asked the people the same questions we ask when we meet Mainers for our project: Where is home to you? Do you have any stories or memories that remind you of home? If you could describe home in one or two words, how would you do that? I met and gathered stories from many native Pittsburghers, a Minnesotan, an Ohioan, and I even happened to talk to a ceramic artist from Portland, Maine who was also in town then! The amazing thing is, no matter where people actually call home, there are many common themes and threads that tie together the stories and conversations we’ve gathered so far. Harriet, a women I spoke with, who has lived in Pittsburgh for the past 40 years told me about raising her two sons in Pittsburgh and working for many years in the public school system before retiring, and re-finding her passion for painting and making textile work. Harriet and I might seem like we don’t have much in common at first, but sitting down with a warm drink in a handmade mug allowed us to ease into a conversation and find our shared passion for art. Harriet with her mug in Pittsburgh. There has been something beautiful about hearing what makes the small and rural Maine communities feel like home to people, but being involved in the Cups of Conversation: 50 States exhibition gave me the chance to reflect further on the power of handmade cups to connect people in general. Jeni, along with many other contemporary ceramic artists, is thinking about many of the same things I'm interested in, like how ceramics objects inherently encourage interaction and conversation. It was such a joy for The Homemade Exchange to participate in this exhibition, and I hope to stay in touch with the people I spent time getting to know in Pittsburgh! I also look forward to continuing to see and experience the power of our handmade mugs, as Devin and I make more project plans for this spring and summer.